Dean of the College of Health Sciences and Nursing Dr. Cathy Taylor was recently honored with the University of Tennessee Health Science Center’s Dr. John W. Runyan, Jr. Community Nursing Award. Named for a Memphian and internationally recognized advocate for the role of nurses in community health care, the award celebrates a champion of the efforts of nurses in the community. 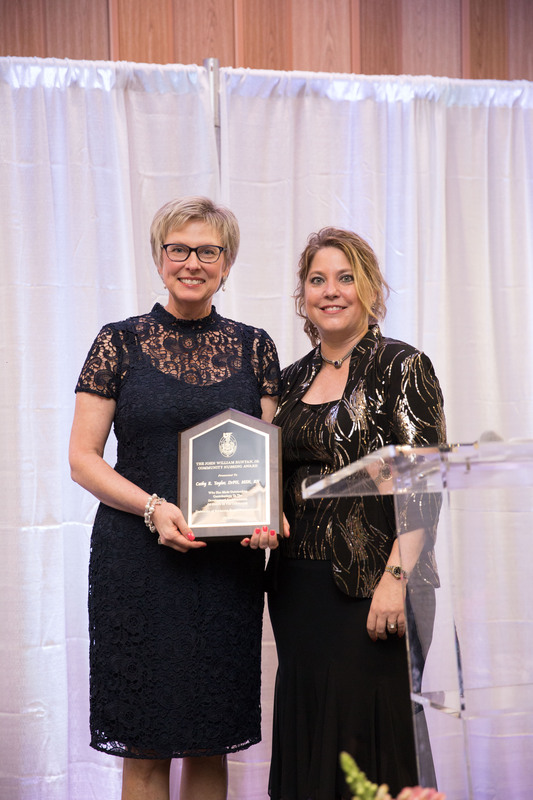 The award was presented at the second annual NightinGala celebration of nursing hosted by the College of Nursing at the University of Tennessee Health Science Center on Friday, May 4. Rear Admiral Sylvia Trent-Adams, PhD, RN, FAAN, U.S. Deputy Surgeon General, was the event’s featured speaker. Taylor holds a doctor of public health degree from the University of Alabama at Birmingham and completed a post-doctoral fellowship in health outcomes at Vanderbilt University. She earned a master’s degree in nursing from the UTHSC College of Nursing and a bachelor’s degree in nursing from the University of Alabama, Huntsville. She served as assistant commissioner for the Tennessee Department of Health’s Bureau of Health Services Administration. Prior to that, she was on faculty at Vanderbilt University School of Nursing as director of the Meharry-Vanderbilt Alliance Disease Management Program and has held administrative and clinical positions at Alvin C. York VAMC, Fentress County Hospital, Middle Tennessee Medical Center and Hendersonville Hospital. In 2006, Dr. Taylor was appointed by then-Governor Phil Bredesen to chair the Tennessee Center for Diabetes Prevention and Health Improvement Board. In addition, she has served as a consultant on projects for the U.S. Department of Health and Human Services Health Resources and Services Administration’s Maternal and Child Health Bureau Leadership Institute and China’s Ministry of Health. Proceeds from the gala support the efforts of the Center for Community Partnerships and Nursing Innovation in the College of Nursing. The center is designed to develop sustainable partnerships with clinical, research and service institutions in the Mid-South to advance health care, foster innovative nursing strategies, reduce health disparities and improve patient outcomes. The NightinGala was held in conjunction with National Nurses Week, which runs through May 12.